How will our universe end? Ruanel: This vessel channeled a few days ago, an entity called Rovanor , who talked about spirits that can move away from the Creation. That was dictated by Johnakan Ur-El. Johnakan conceptualized that a spirit might die, according to your concept of what death means to you. Then, it would be important to make a session with Johnakan as soon as possible. Johnakan Ur-El: Hello, dear brothers. Interlocutor: Johnakan Hello, How are you? Interlocutor: Are we talking about Eon? Interlocutor: Aren’t we talking about Abba? Johnakan Ur-El: No, about Eon. The Creation is a Product of the manifestation of Eon’s 10%. The approach of the dear Rovanor was: What would happen, hypothetically, if that spirit embodied in a spacecraft departs from the Creation and in that moment the Big Crunch takes place and the universe ceases to exist? Some of you, very coherently said: "The Creator would extend a pseudopod and He would catch this lost spirit." Actually that wouldn’t happen because there is Free Will. Automatically there would be a bloop! And this Creation would collapse on itself. Remember that I'm talking in a basic way because it is difficult to convey the concept to spoken language, something I have said a hundred times. That spirit would be like an "orphan" and not having the Creator’s Essence, if the Creator stops being manifested, the spirit would cease to exist because the spirit is part of Eon. It's like an electric lamp unplugged from the wall and the filament ceases to be incandescent because there is no more electric current flowing. Let’s suppose that that incandescence is called "conceptual life" because the spirit is a conceptual energy. And the energy would be the electricity, then if the lamp is unplugged, the electric current stops flowing. If Eon stops being manifested, the energy of the spirit ceases to exist and disintegrates itself. That is, a spirit might die. Interlocutor: Yes, but that is relative because the spirit is always within Abba. Or the spirits goes far away? Johnakan Ur-El: No, because the spirit, dear brother, is part of Eon, not part of Abba. Interlocutor: But Eon is within Abba. Johnakan Ur-El: Sure. However, Eon and the spirits have a special vibration and Abba’s vibration is different. If Eon is not manifested, it doesn’t mean that Abba has Eon under his wings- so that you understand me- but the spirit fails to be manifested as well. If the spirits is outside Eon, the spirits crumbles. Johnakan Ur-El: We are talking about something hypothetical brought up by Rovanor, also with my suggestion. Anyways, the question of the spacecraft going out of the universe is impossible and I'll explain the reason: the Big Bang process- and I don’t know if this will be a new paradigm- because obviously the scientists know that it takes millions of years to form galaxies, stars and planets. It’s not that there is a large explosion and immediately and automatically the whole Cosmos is formed as we see it today. Do you understand me? In the same way, when the universe will be contracted, in the last few millions years before the Big Crunch, the galaxies, stars and planets will be disintegrated. That is, there will be no longer physical life millions of years before the Big Crunch takes place, and we all will exist only as spirits then. Do you understand that? 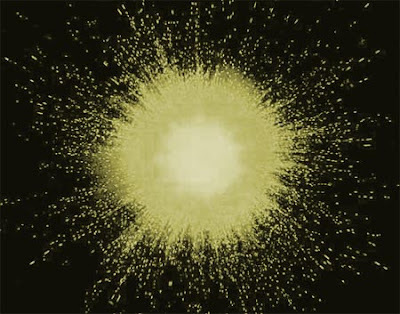 Johnakan Ur-El: I repeat it again: the Big Bang takes place and millions of years pass until the universe is formed and well established as it is now. That is, there is NOT a large explosion and everything is formed all at once. Interlocutor: Wow! Okay. That was the question I had: This case is so hypothetical that it will never happen, in fact, it never happened. Johnakan Ur-El: Exactly. However, it's okay because it’s important to clarify these questions to the people. And, as this vessel that channels me, whom I think I know him from somewhere – Can I be as funny as Ruanel? – Precisely, we don’t want to give mysteries to people, but to resolve mysteries. Then, this case is somewhat hypothetical because it will never happen. Interlocutor: Okay. Is this what you were going to talk about the death of a spirit? Johnakan Ur-El: Sure. One more thing: the spirit, by itself, cannot abandon the Creation. You may get out of the Creation when there is a 10% spirit embodied on an artifact, such as a spacecraft, but a spirit, by itself, cannot leave the Creation because the spirit is embraced within it. Johnakan Ur-El: Unless that a 10% embodied spirit travels through time in a time machine manufactured by that 10%. Johnakan Ur-El: Very good. Exactly. Johnakan Ur-El: That would be wonderful. Interlocutor: And also, of course, Abba. One of the things I would like to ask Abba - but I don’t know if you can answer my question- is the question related to movement because if Abba's is the Whole, Abba couldn’t move, but if Abba could move, then Abba wouldn’t be the Whole. And then, the other question that intrigues me greatly is: what is the last number? That is, if the last number doesn’t exist, the paradox would be: if Abba is Everything, the last number would have to exist? Johnakan Ur-El: That could be a trap, but I would say: "The last number is the first number." Interlocutor: Yes, but I would not understand... heh, heh! Johnakan Ur-El: Okay. We are in permanent contact. All my Light to you all. Interlocutor: So long, Johnakan, and thank you. This entry was posted at Thursday, July 28, 2011 and is filed under Cosmology, Paradigms . You can follow any responses to this entry through the .